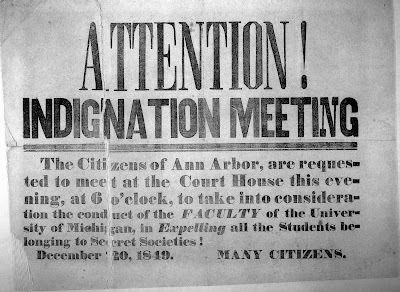 I'm reading the poster to mean that the UM faculty expelled those students who were members of secret societies (how did they know which ones?) and that the organizers of the meeting were opposed to that. 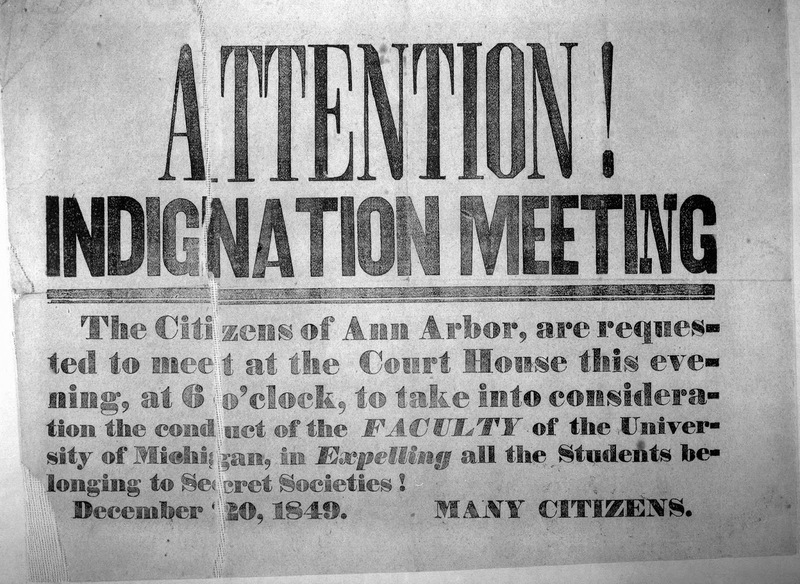 Or were the organizers calling on faculty to expel students who were members of secret societies? I'm thinking they expelled all the students in secret societies. But how did they know who were in the secret societies? I remember reading that in my research! I will come to an Indignation Meeting and be indignant about....something. Another fun thing to do is to read the old newspapers online. Some of those people had it going on, seriously...they partied more than we did. And it was all in the paper--the precursor to Facebook. They always had social listings "brevities" about a2, Saline, Dexter, etc. and basically everyone said what we say on Facebook and Twitter. I started a blog where I would recap particularly fun stuff but then I got busy and neglected it. Didn't we just have one of these a couple weeks ago over Brandon?